exhibited in BankART 1929, NPO Children meet Artists and so on. It is my personal project for long time. Every year, I get a lot of vegetable or flower seeds from my planting projects,events and gardens. 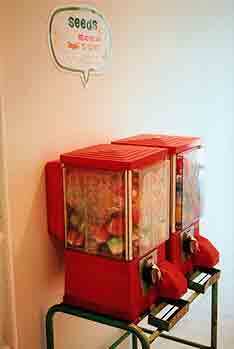 So I promote to generalize to enjoy growing SEEDS somewhere in the Earth with vintage vending machines for my art work. which were located very near by elementary schools in our school days. The images below were the examples of the seeds' instruction papers.